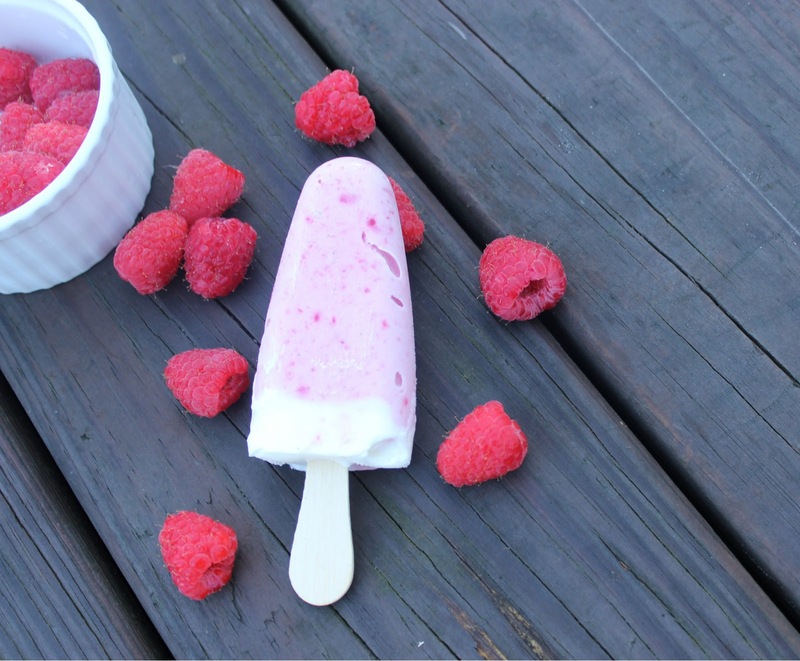 So today I'm bringing you my new favorite popsicle recipe (even though fudgesicles are pretty close), Raspberry Creamsicles! I adapted this recipe that I saw the other day! 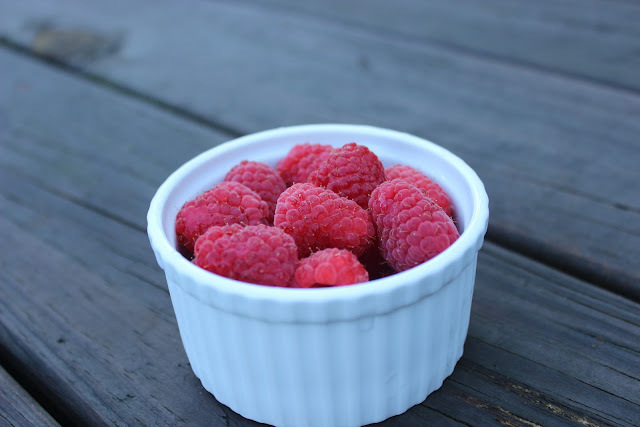 We have been on a berry kick in this house the last couple of months so I brought home four raspberry containers the other day. This recipe is super easy and it's such a yummy treat! 1. Start off by puréeing the rasberries in the food processor or blender until smooth. 2. Then I poured the purée through a strainer into a measuring cup to remove the seeds. This is optional, but Sienna is such a texture person I thought it would be best to leave them out. It should amount to 1/2 cup. If not just purée more raspberries. (Feel free to add in juice or water to liquify it a bit- I added a splash of Cran-raspberry juice. 3. Next mix the purée with 1 1/4 cups of vanilla ice cream until smooth. Pour or scoop this mixture into the molds leaving space at the top for the cream. 4. In a separate bowl pour in 1/2 cup of heavy whipping cream and whisk by hand or with your whisk attachment of your mixer until soft peaks forms. Top off each popsicle mold with the cream and freeze for 6 hours or so! This recipe filled six small popsicle molds! Feel free to double or manipulate this recipe as needed! These pops are DE-licious! The perfect summer treat! If you are eating healthy you could even sub in some frozen yogurt for the icecream and I'm sure they'd be great! 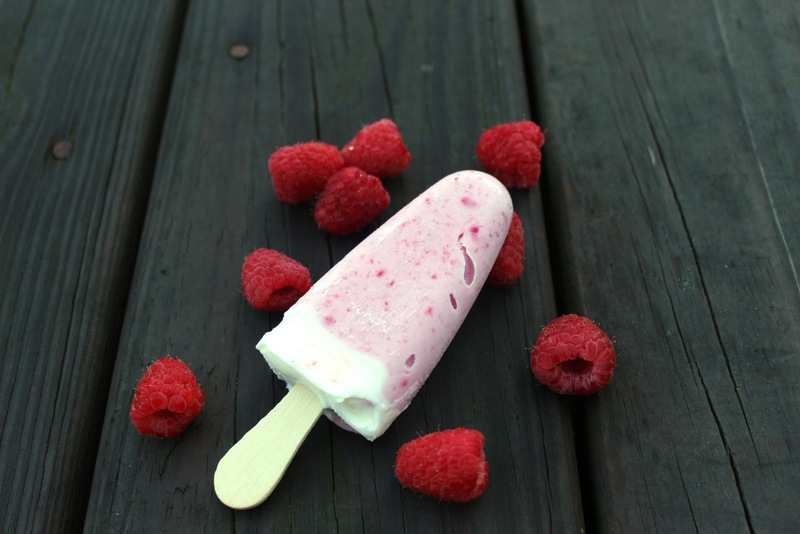 What's your favorite popsicle recipe I can add to my lineup? Thanks for following along for All Things Popsicle Week, we had such a great time! You can click here, here, and here to catch up on all the festivities you may have missed! !